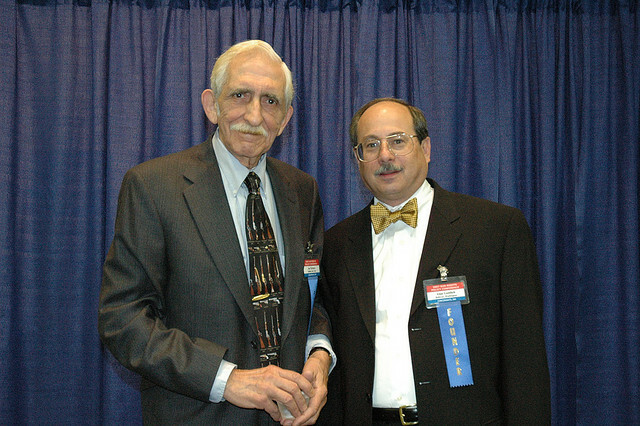 The Second Amendment Foundation’s president, Joe Tartaro, with its founder, Alan Gottlieb. Photo courtesy SAF. Licensed under a CC-By-ShareAlike license. Washington state made national headlines last election becoming the first state to approve both legalized marijuana and gay marriage. Several states are now moving in that direction. The city of Sea-Tac voted in a $15 minimum wage, the largest in the country, although the courts subsequently ruled the vote didn’t apply to employees at Sea-Tac airport because the Port of Seattle has final authority over that venue. Nevertheless, 2014 opens with new Seattle City Council member Kshama Sawant planning to introduce a $15 minimum wage for the city and a similar initiative could find its way on to the ballot statewide. Now people all over the country are talking about raising the minimum wage and even President Obama’s saying it might not be a bad idea. It’s no wonder some people are looking at the city and state as some sort of petri dish that defines the next big political movement. Early indications are that gun control could be a major issue in the 2014 election. Despite some high-profile shootings in 2012 and early 2013, no gun legislation was passed in Congress last year – including closing the so-called “gun-show loophole.” But here in Washington, there will probably be two initiatives on the ballot next November that are diametrically opposed. It shapes up as a classic liberal vs. libertarian battle; progressive Western Washington against rural Eastern Washington. Initiative 594 would make background checks mandatory in any sale of firearms. Federal law only requires background checks by licensed dealers. According to the Washington Alliance for Gun Responsibility (WAGR), 40 percent of gun transfers take place without a licensed gun dealer. These include purchases at gun shows and on-line sales. About 6.6 million guns were sold in the US last year with no background check. Under I-594, when a gun changes hands, both parties would go to a licensed dealer to conduct a criminal background check. WAGR which calls itself “a coalition of concerned citizens and organizations working together to force common sense solutions to reduce gun violence,” spearheads I-594. Venture capitalist Nick Hanauer, along with his wife Lenore, are two of the three biggest donors to the I-594 campaign along with former Microsoft CEO Jon Shirley. Seattle billionaire Hanauer is one of the richest progressives around. He’s also a supporter of the $15 minimum wage and the rich generally paying more taxes. Local businessman Tom Campion, who’s had President Obama as a dinner guest, has also contributed heavily to 594. On the heels of I-594 came another initiative – I-591 sponsored by the Second Amendment Foundation, a tax-exempt (501) non-profit located in Bellevue, founded by Alan Gottlieb in 1974. 591 would maintain the status quo and prohibit the state from having more restrictive laws than the federal standard. The SAF made headlines recently as one of the major sponsors and promoters of a “Gun Saves Lives Day,” originally scheduled for Dec. 14, the one-year anniversary of the Sandy Hook shootings where 20 people were shot at an elementary school in Newtown, Connecticut. Gottlieb, currently Vice President of SAF, originally said that he wanted the pro-gun movement (who he usually refers to as “Second Amendment defenders”) to “own” that day. But the day of celebrating guns was changed to Dec. 15 – Bill of Rights Day – after numerous complaints, including those of families and friends of the Newtown victims. Supporters of both referendums have delivered 325,000 signatures to the Secretary of State’s office and they should be verified sometime in February. The initiatives actually go to the state legislature first, but politicians in Olympia put controversial referendums on the ballot so they can’t be criticized for making a decision. Washington voters last considered a gun measure in 1997. Initiative 616 would have criminalized the transfer of any handgun without a trigger lock and would have mandated licensing of firearms. It was handily defeated, 71 to 29 percent. Moses himself, actually five-time NRA President Charlton Heston, came to Washington to speak against the proposed law. But these are different times. Polls show that 80 to 90 percent of the population now favors mandatory background checks. Washington may once again be in the forefront of enacting legislation that other states might follow. The one sure thing is that both I-591 and I-594 supporters will be pumping mucho money into the state to get their referendums passed.